DECC have announced that FIT rates for systems <50kW will be subject to a 3.5% cut. Despite this a 4kW solar pv system can still offer rates of return in excess of 10%! The new rates are listed below. If you want to beat the 1st November deadline get in touch quick on 0344 567 9032 for your free 10 minute solar survey. Customers who proceeded with their PV installations between 12th December and 3rd March still have no idea whether they will qualify for the pre-12th Dec rates, that is until a decision is reached in the governments controversial appeal. As of the 1st April all properties where customer propose to install a solar PV system must have an Energy Performance Certificate (EPC). The EPC must demonstrate that their property achieves a minimum level ‘D’. Still out to consultation are the cost control measures for PV which propose reductions to tariffs every 6 months for all new installations. Based on how the government have managed previous “consultations” it is very likely that such changes will be implemented, irrespective of public or industry points of view. This could see cuts of up to 35% from the new 21p rate as of the 1st of July. PV FIT have equipment in stock and installation teams ready to assist any customers wishing to proceed with a PV installation between now and the 1st of July. Even at 21p, solar PV still offers great rates of return due to recent and ongoing reductions in the cost of equipment. Contact us today for your free solar survey and quotation. The cost from PV FIT for a domestic Energy Performance Certificate is £99 including VAT. We are offering a full refund of the EPC cost for all customers who proceed with a PV FIT installation post 1st April, where their property achieves a level D. We can arrange everything so please get in touch today to book your EPC survey. DECC have today announced their response to the much maligned FIT consultation (phase) which closed on 23rd December 2011. To be eligible you must have had your installation completed and FIT application form and supporting documents received by your chosen energy supplier by the 3rd March. Solar panels installed on or after April 1, 2012 will be required to produce an Energy Performance Certificate rating of D or above to qualify for the full FIT level. The tariff for a building is rated below ‘D’ will be 9p/kWh for the lifetime of the tariff, which means energy efficiency measures will have to be completed ahead, or on day, of your PV installation. £530 for a mid-terrace house currently rated as E that already has loft insulation, but where cavity wall insulation and hot water cylinder insulation are needed. The typical cost of obtaining an Energy Performance Certificate (EPC) is £50-100 (please contact us for a quote) and will require the visit of an energy assessor to inspect your property. The whole process will take 5-7 days to complete and upload to the central register. Defined as installations owned by any individual or organisation a tariff level of 80 percent of the standard tariff, to reflect the lower costs that such installations benefit from. As a response to feedback, DECC has changed the threshold for the lower tariff from more than one, to more than 25 installations operated by an individual or organistation. However, DECC is consulting on a proposal that would allow social housing, community projects and distributed energy schemes to be exempt from the reduced multi-installation tariff rates. DECC’s proposed mechanism for changing tariffs after July 2012 will include an automatic baseline transgression of 10 percent every six months, which can be triggered early if deployment exceeds ‘pre-determined’ levels. The system will be reviewed annually to ensure that it is performing well against its objective. Further cuts on 1st July 2012?? DECC is also proposing that solar FIT tariff levels should reduce from July 1, 2012. The rates for July will be 13.6p or 16.5p depending on the volume of deployment of PV in March and April 2012. Given the panic this is likely to induce we would predict the lower 13.6p rate coming into effect which constitutes another draconian 35% cut in the standard tariff rate. What if I install a system pre-3rd March? DECC still intends to pursue its appeal to the Supreme Court, which if they win will mean they reserve the right to apply new rates (see above) to all installations completed between 12th Dec 2011 and 3rd March 2012. This still leaves installers, and consumers, in the position that we cannot guarantee the rate you will receive if we complete your installaiton within the interim period. The government may consider an appeal in order to ensure demand for new solar installations remains low in the run up to March 3 – the new cut off date for the higher rate of feed-in tariff incentives. If the government does not appeal against today’s court ruling the level of incentives available for installations completed before March 3 will be confirmed at 43p/kWh. Ministers are concerned that the ruling could spark a month long gold rush as households and businesses rush to take advantage of the higher rate, eating further into a feed-in tariff budget that has already been exceeded for this year. We will provide more updates over the coming days, however please do not hesitate to call us on 0344 567 9032 if you have any questions/concerns. The Court of Appeal has upheld a High Court ruling that Government cuts to the Feed-in Tariff were unlawful. The three Lords Justices of Appeal announced their reserved judgement this morning following a hearing 10 days ago. Today’s decision is a damaging blow to Ministers and officials at the Department of Energy and Climate Change, who must now introduce the contingency date of March 3 for the start of the 21p rate for solar PV and not the original December 12 deadline. The court judgement also means customers who have had solar panels installed and are registered ahead of the new March 3 cut-off point will now receive the original 43p rate for 25 years. Therefore, the industry has another 5 week period to install at the higher rate of 43.3p. Customers who register on or after March 3 will qualify for the current higher rate until April 1, when it will drop to 21p. Dave Houston, MD of Chester based PV FIT Ltd, said: “We welcome the news of tariffs reverting to 43.3p until March 3rd, although this puts us in an even tighter position to deliver solar projects than before Christmas”. “We will be operating on a first come first served basis in order to ensure customers who proceed with us have their paperwork completed and returned to the energy companies before the March deadline”. It’s very simple to get a PV FIT quote over the phone by calling 0344 567 9032, or via our website survey request. It only takes 20 minutes and you will receive a quotation by email the same day! As we explained in our article on the 11th Jan, it has been nigh on impossible to determine what the current FIT rates are, which has dented consumer confidence. 21p/kWh means a 4kW system on a South facing roof currently offers a 10% rate of return – that is until 31st March when FIT rates could reduce further, and home energy rating of level C or above may be introduced. To get a quote call us today on 0344 567 9032, and beat the rush! Feed In Tariff Review – A step-by-step guide to what happens now? As the date for the consultation review of the ‘FIT’s review’ looms, there is uncertainty in the industry due to the current situation. The Judge ruled that the 12th December reference date for the proposed cuts to the FIT, occurring two weeks before the consultation officially ended on 23rd December, would be illegal. “We disagree with this for a number of reasons. The overriding aim of the proposed reduction in tariffs for solar PV is to ensure that over the long term as many people as possible are encouraged to install small scale low-carbon generation (including other technologies as well as solar PV) and benefit from the funding available for the FIT scheme. Without an urgent reduction in the current tariffs, which give a very generous return, the budget for the scheme would be severely depleted and there would be very little available for future solar PV generators, or for other technologies. Our view is that the urgent steps we have proposed to protect the scheme for the future are fully consistent with the scheme’s statutory purpose. Our MCS certifying body NAPIT (National Association of Professional Inspectors and Testers) have been working closely with the DECC and sit on a number of official lobbying groups, part of which included meetings with Minister Greg Barker to discuss the long term plan for a sustainable renewable industry. Statistics show following the FIT tariff reduction on October 31st the number of solar PV installations grew by approximately 50% per week, reaching around 30,000 installations in the last week leading up to the 12th December deadline. If the Government does not win an appeal, a renewed period of tariffs at 43.3.p/kWh is inevitable, although how long this will be available for is not clear. How do you get a quotation and what FIT rate will you get? If you’ve read this far you will see the governments handling of the whole process has created a huge amount of uncertainty, leaving businesses and customers uncertain what FIT rate they will get. We will therefore be issuing all quotes based on the post-12th December rates which were proposed in the FIT review – see Feed In Tariff (FIT) – which based on the information we have should be worst case scenario for installations completed before the 31st March 2012. Due to further reductions in cost of equipment in Jan 2012 the lower rates still demonstrate attractive returns of between 7-10% per year. We are expecting a rush up to the 31st march deadline, due to any new requirements/rates being introduced on the 1st April, so to avoid disappointment contact us ASAP for your free no obligation solar survey. DECC have today confirmed the booming solar industries worst fears by publishing their “consultation” on feed in tariff cuts for PV systems. 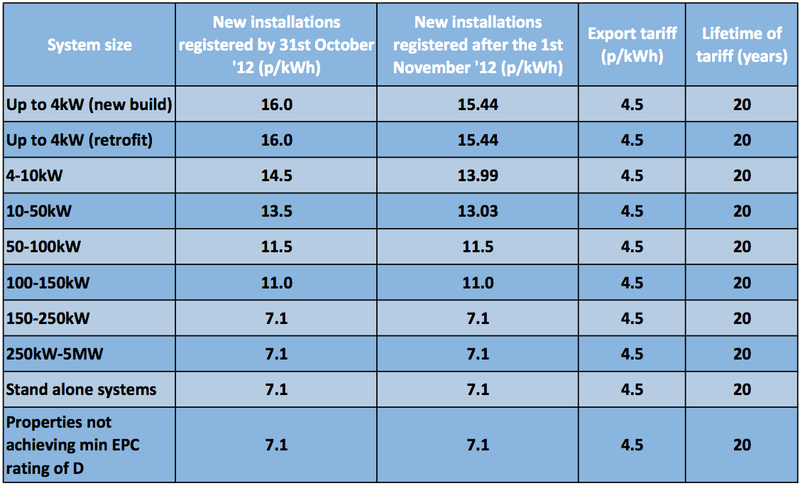 The table above shows the proposed deep cuts will apply to all new installations completed after the 12th December 2011. This gives customers and installers just 6 weeks to complete any existing contracts at the current rates.What’s more although the proposals are “out for consultation” the changes in tariff levels come into effect before the consultation is due to close on the 23rd December. David Houston, Director at Chester based PV FIT Ltd, says: “Today’s announcement confirms our worst fears and makes a mockery of the coalitions claims to be behind renewables and their intention to ween people off centralised produced power”. 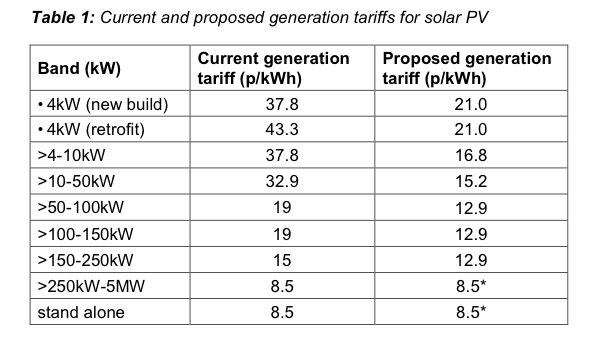 The proposed domestic tariff levels, which are apparently “out to consultation”, mean a 4kW pv system on an optimum South facing roof will now take 11.3 years to payback, up from 6.5 years under current tariff levels. “We accept that costs of PV equipment have come down in the 18 months since the FITs were introduces in April 2010. These savings however only translate to a 30% saving on a fully installed system. A knee-jerk 50% cut to FITs is disproportionate and will severely affect investor confidence in a sector which has already seen large PV systems disappear over night due to similar draconian cuts earlier this year” says Houston. Introduce new multi-installation tariff rates for aggregated solar PV schemes i.e. where a single individual or organisation owns or receives FIT payments from more than one PV installation, located on different sites. a new energy efficiency requirement for FITs for solar PV (see section 3 of consultation for more detail). The new requirement would apply to all new solar PV installations with an eligibility date on or after 1 April 2012 which are attached to or wired to provide electricity to a building. Many are predicting a solar gold-rush up to the government’s imposed cut-off point of 12th December, after which solar firms will be left to reassess their offerings. There are likely to be severe job cuts in an industry which has created over 20,000 new jobs in the past year. David Houston advised, “PV FIT currently have spare capacity in the lead up to the 12th December. To avoid disappointment you will need to book your installation ASAP – if you haven’t already had a quote we can survey over the phone in 10 minutes and will email a quote same day”. Call today for your free solar PV quotation on 0344 567 9032 or fill in our free solar survey. Ofgem says the profit margin for energy firms has risen from £15 in June, to £125 per customer per year. The profit figure is a snapshot of the amount suppliers would make from dual-fuel customers if energy prices and bills stay unchanged for the next year. Predictably energy suppliers argue that Ofgem’s figures were misleading and do not paint a realistic picture of profitability. “A snapshot of profits every few months does not provide a realistic picture of the average profits over a year of companies in the sector,” said Christine McGourty, director of Energy UK, which represents energy suppliers. “The approach adopted by Ofgem in calculating this figure is entirely theoretical and does not reflect how a responsible energy supply business manages its energy procurement strategy in reality,” said SSE, which estimates its profit margin at £62 per customer. 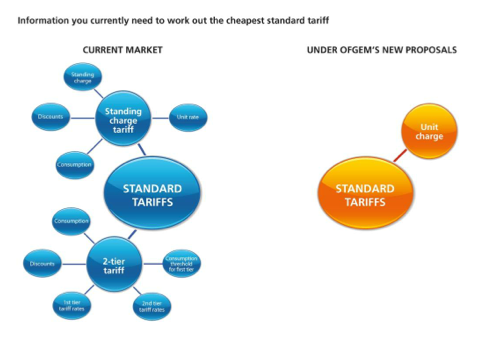 Ofgem also say they are intent on forcing suppliers to simplify their tariffs to make it simpler for consumers to see whether they are on the best possible deal. Energy suppliers will be forced to have no-frills tariffs, as part of The simplification plan, which would consist of a standing charge – fixed by the regulator – plus a unit charge for energy used. This would mean the only figure which consumers would need to look at when looking to switch deals is the unit energy charge. Under Ofgem’s simplification plan, more complicated tariffs would still be available, but they would have to be for a fixed period, with price increases not being allowed for the duration of the deal. 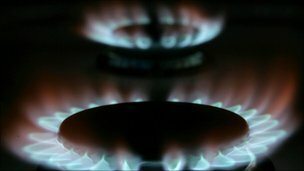 The average dual-fuel bill is now £1,345 a year following recent price rises from all the big suppliers. “When consumers face energy bills at around £1,345 they must have complete confidence that this price is set by companies competing in a fully competitive market,” said Ofgem’s chief executive Alistair Buchanan. Why put up with constant price rises? Contact PV FIT today for your free solar survey and you could start earning in excess of £1000+ p.a. from the Sun! New research conducted by utility and environmental consultancy Gemserv has identified huge demand from British households to ‘Go Green’ and produce their own energy. Gemserv’s study of over 2000 British adults found that 61% of homeowners would consider installing means to generating their own energy, whether using solar PV panels, installing air source heat pumps, using biomass fuel or harnessing the power of nature by using hydro power. If the so-called ‘green gap’ could be bridged, approximately 15 million tonnes of CO2 could be saved each year, the report claims. However, despite the UK’s appetite for renewable energy, Gemserv’s research found that the widespread lack of awareness about installation, cost savings and benefits is stopping people from reducing their carbon footprints. In these challenging economic times, expense was understandably a big consideration, 57% of homeowners who would not consider installing any of the renewable initiatives from a list they were shown said it is too expensive and 32% of people were unsure how much money they could save and/or earn from renewable energy sources. A further 65% of Brits weren’t aware of the government’s financial incentive for generating renewable energy. Dave Houston, MD of chester based solar installers PV FIT Ltd says: “I am not surprised that Germserv’s survey identified that a significant proportion of the public would be interested to install a renewable energy technology on their homes. The costs of renewable energy systems can put many people off, despite the very attractive returns offered by schemes such as the Feed-in Tariff (FITs), due to the substantial capital outlay to install them in the first place”. “In the past year FITs have vastly increased the size of the UK’s solar PV industry, which in turn has seen the cost of equipment & installation drop significantly. In April 2010, a typical 4kW PV FIT system cost £16,000 including VAT. In October 2011, the same system has reduced to nearer £12,000 – with a South facing system offering combined tax-free income and savings of £1700p.a”. “With wider awareness of FITs and access to low cost, or preferably, zero interest finance we feel the renewables market could be vast, with capital costs reducing at an equally rapid rate”. FITs are due to reduce by 9% for new entrants in April 2012, although many in the renewables sector are predicting a greater reduction due to the schemes success in reducing equipment costs.